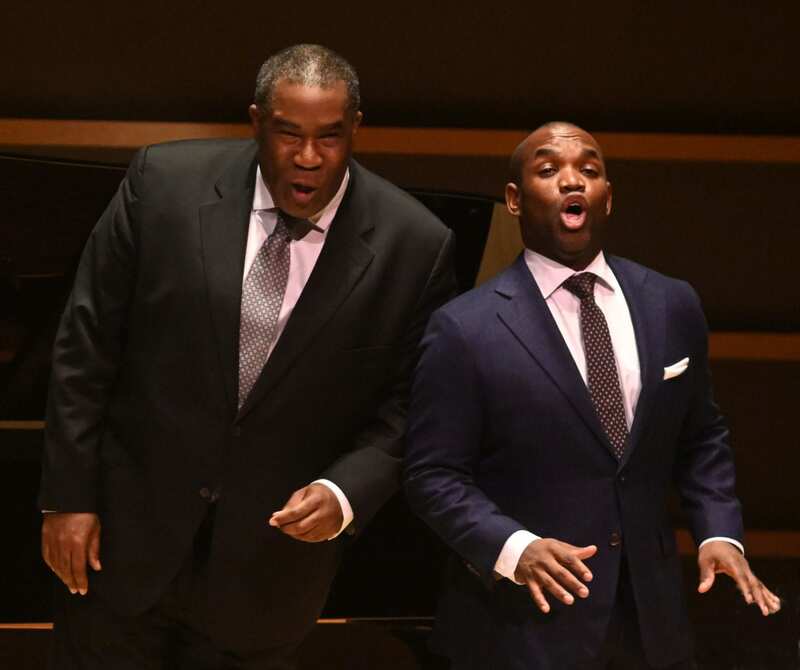 Lawrence Brownlee and Eric Owens performed at the Schwartz Center on March 22. Atlanta is a city that attracts international artists. They visit us frequently, charming and edifying us with their artistry before moving on to the next city. But sometimes Atlanta is home base for these A-list musicians, as is the case for operatic tenor Lawrence Brownlee, who performed with bass-baritone Eric Owens at Emory University’s Schwartz Center on March 22 before an appreciative audience that included Brownlee’s friends and family, including his eight-year-old son Caleb, who listened backstage. It was arguably one of the finest vocal recitals heard in Atlanta over the last decade — and that’s saying something. Brownlee is classified as the definitive Rossini tenor, specializing in bel canto repertoire – operas written by Rossini, Bellini and Donizetti in the early 19th century. This was an era when a singer’s vocal prowess depended on the ability to execute virtuosic passages that were extremely high and florid with exceptional beauty. In sports terms, he’s the Julius Erving of opera, soaring above every other voice on stage, and his high notes are a slam dunk every time. Brownlee has sung at all of the top opera houses including Metropolitan Opera, Teatro alla Scala, Royal Opera House Covent Garden and Opéra National de Paris — never at the Atlanta Opera, but one can hope. Brownlee and Owens share a manager at IMG Artists, who arranged this 12-city recital tour with Atlanta being the final stop. But beyond the professional connection, Brownlee and Owens have been good friends for 20 years. And yet, they’ve only had the chance to share the operatic stage twice — once at Boston Lyric in 2004 for The Italian Girl in Algiers and later at Houston Grand Opera for a production of The Barber of Seville. The reason? Their voices and typical repertoire couldn’t be more dissimilar. If Brownlee is an effulgent trumpet, then Owens is a majestic tuba. To describe Owens, it’s best to return to the realm of sports. Picture your favorite NFL linebacker in a tuxedo: Owens is a towering presence, and his bread and butter is Wagner operas. His voice is vast and profound. Owens has played Alberich in the Metropolitan Opera’s Ring Cycle directed by Robert LePage, the title role in Der Fliegender Holländer, and Wotan in in Die Walküre. 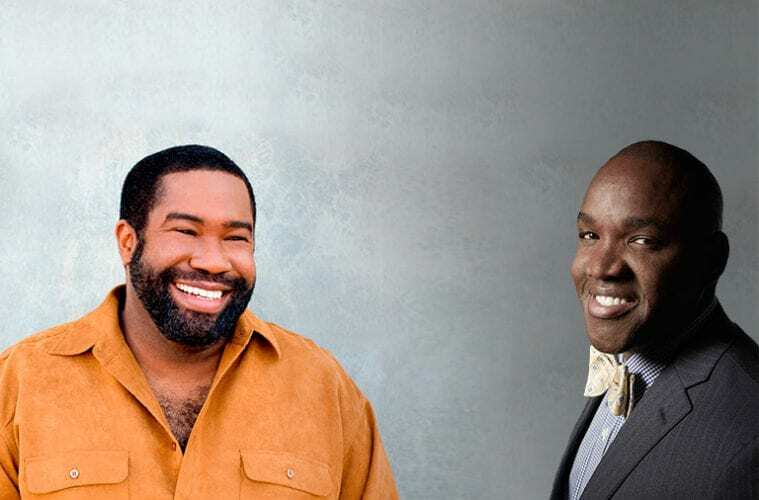 Most recently, Owens sang the role of Porgy in Gershwin’s iconic opera Porgy and Bessat the Dutch National Opera in Amsterdam. It was also just announced that he’ll reprise the role as Porgy in the same James Robinson staging at the Met next season. The two operatic superstars launched into the first half of the recital with celebrated arias. Myra Huang commanded the piano and wasted no time with lengthy transitions — one aria dovetailed into the next. They began with Mozart’s “Se vuol ballare” and “Il mio tesoro,” upping the ante little by little. Owens gave us Verdi’s “Infelice! E tuo credevi.” After the lighthearted Nemorino-Dulcamara duet “Voglio dire, lo stupendo elisir” from Donizetti’s The Elixir of Love, Brownlee wooed us with “Una furtive lagrima.” Owens responded with a sinister rendition of “Le veau d’or” from Faust. Brownlee then grabbed the baton and bedazzled with “Ah! Mes amis, quel jour de fête!” — the nine high Cs effortless and his tightly wound bel canto motor thrilling. Surprisingly, balance was never an issue when Brownlee and Owens joined forces for duets like Margaret Bonds’ arrangement of “He’s Got the Whole World In His Hands” and Frank Loesser’s “Dolores.” Terrific acoustics at the Emerson Concert Hall and the wonder of the overtone series evened the playing field between the two. But above all, the credit must go to Brownlee and Owens, two operatic giants at the height of their vocal powers who gave us vocal fireworks and honest fervor.